Chop handful of fresh dill. Take a wooden bowl and fill it with yogurt then salt & pepper it. Add the chopped dill and mix well! Finish off with some olive oil. Cut open 300g of free-range chicken breast. Mix 1 hand of flour along with 1 tbsp. 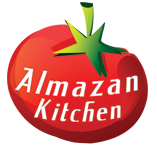 of Almazan Curry and salt then coat chicken breast in it. Crack and whisk 2 free-range eggs. Mix full hands of fresh breadcrumbs with 100g of grated parmesan. Take the coated chicken breast, dip it into the eggs from both sides and then coat in parmesan breadcrumbs. Preheat the pan, fill it with frying oil. Fry the chicken until crispy golden brown crunch. Serve the chicken on the special corn salad plate. Do not forget to use sauce!